The 27th of May 2015 has been a day of mourning for all freedom-loving people due to the fact, that as of that day the federal cabinet enacted a revision of data preservation with heavy consequences for all of us. Unless the law is overturned by the Federal Constitutional Court, telecommunication data from our computers and telephones will soon be recorded and filed for the duration of 10 weeks. In the US, governmental data preservation had been processed by the NSA up until the end of May. Nevertheless, the Obama administration now also presses for a new regulation. That doesn’t change the commercial use of our personal data – it carries on. However, by now our campaign has even reached the economy. Although our campaign is only three months old, we are already collecting our first prizes from renowned advertising festivals. 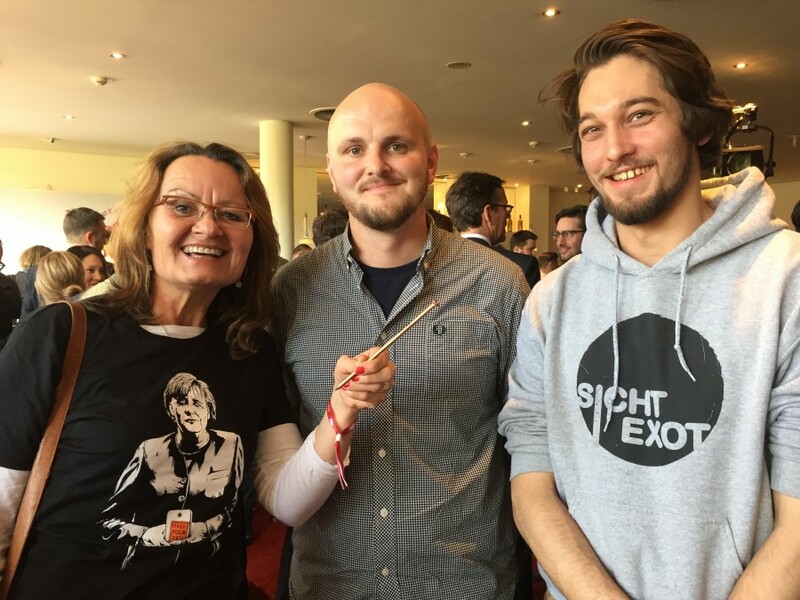 On the 21st of May our “Video Bomb” came in third in the category “Internet Movie”, taking home the “bronze nail” of the Art Director’s Club. The jury honored the “exceptionally” creative work in the field of data ownership. We are particularly excited about the award as the ADC championship is one of the most meaningful competitions in the German advertising landscape, with only 10 percent of all submissions being awarded. Together with Andreas Gröger (left) and Navid Shahabi from the hamburg based advertising agency in charge of the campaign - "Kolle Rebbe", our campaign manager Elke Jacob had the honor of accepting the award. Our journey continued, only a couple of days later, on the other side of the great lakes. Our “Keynote” video came in third at the New York Festivals World’s Best Advertising, being awarded for the “perfect use of the medium” online movie – thanks to your great support. Thank you so much! This was the category, in which our Video Bomb impressed the jurors. 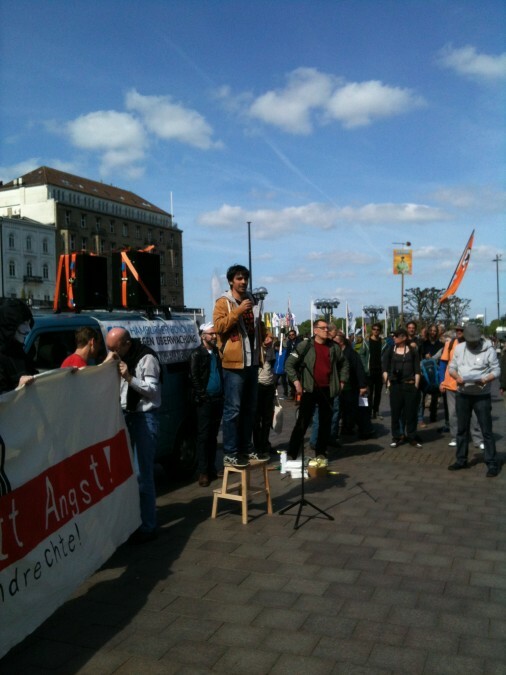 On Saturday before Pentecost, Ali was one of the speakers at the demonstration “Freiheit statt Angst” (“Freedom Instead of Fear“) in Hamburg. Approximately 1,000 participants were there to support the alliance of various political parties and organizations, raise their voices against a state monitoring and data preservation. Ali's speech was very well received by the crowd at Hamburg Rathausmarkt. A tad more peaceful, but not less impressive was the reading on May 29 as part of the event “Literature in the houses of the city” at JDB Media in Hamburg. Sebastian Rudolph, a member of the Thalia Theater ensemble in Hamburg, read from Dave Egger’s novel “The Circle” that deals with ideals such as freedom, democracy and privacy. 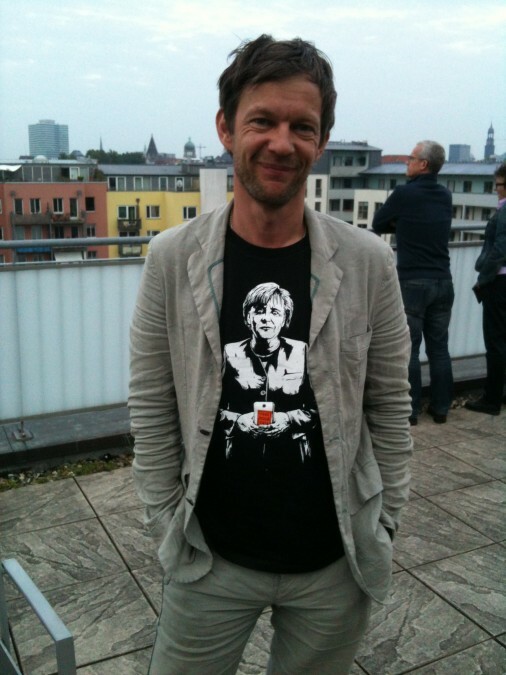 Many thanks to Sebastian who chose our campaign shirt with the subject Angela Merkel. This particular shirt, along with many others, will soon be available in our online shop. Sebastian Rudolph in Hamburg after reading from Dave Egger's well known novel “The Circle“. 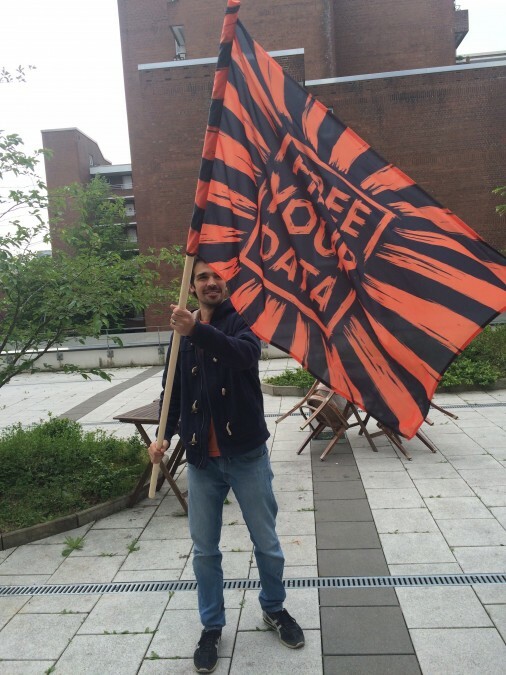 Ali with our brand new campaign flag “Free Your Data”. Together we can make a change in the political climate for the sake of the people. That’s the reason why we need you to keep supporting our campaigns, pick up our FYC stickers and flyers, and spread them at events and demonstrations. You’ll be amazed how clueless many people still are about what happens to their data.